Co-editors of the Special Section on Post-Truth Nicholas Michelsen and Benjamin Tallis look at the Post-Truth Story so far. They introduce including the 3 main forms of response and Post-Truth's implications for and in information, communication, democracy and war. They go on to look at the entanglements of strategy, suspicion and scholarship and introduce the pieces in the special section. 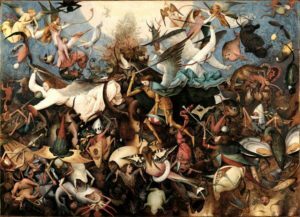 Pieter Bruegel, The Fall of the Rebel Angels, public domain.